Hearts were held by Raith on Saturday. And this weekend they'll travel to Cove. Barry Smith expects nothing less than another tough fixture when he takes his side to meet Cove in their final League Cup game this weekend. Cove may be propping up the group, having lost all three of their games so far, but there will be nothing taken for granted by the Raith manager. The Highland League outfit have only narrowly lost out to Cowdenbeath, Inverness and Hearts in their opening three games and certainly haven’t been disgraced against opposition from the higher divisions. The game will be the last of Raith’s four in the tournament, with the side showing steady progress from their shock opening day defeat to Cowdenbeath. On Saturday, Smith’s men held Premiership Hearts to a 1-1 draw before losing out to an 87th-minute winner at Inverness away from home on Tuesday. The chance is there for Raith to finish with a flourish at Cove on Saturday but Smith says his side must earn any result they take. He said: “It’ll be another tough game. “They are a team which plays with confidence based on the fact they won their league last year. “They have some good players; Mitch Megginson and a couple of others who have played at a good level, so it won’t be a case of us turning up at their new stadium and winning the game. Raith pushed their hosts all the way in the Highlands on Tuesday, looking on course for another draw and a possible penalty shoot-out win until Daniel McKay popped up in the closing stages with a winner to make the score 2-1. Again, though, there were positives for the boss,who managed to get some much-needed game time into Nat Wedderburn, who appeared as a half-time sub for Iain Davidson. The game was also lit up by a stunning equaliser from Grant Gillespie. “Having watched it back, it’s a foul for their second goal,” said the manager. “I’m disappointed to lose the game because, in the second half, we controlled certain parts of it. “In the first half, we had to be resolute defensively and I thought Inverness knocked the ball about well. “We really had to defend well and I think we did that. Smith hailed Gillespie’s effort, his rocket volley coming just a few minutes after Inverness had taken the lead through Nathan Austin. Smith was able to list just four subs on Tuesday night, the short bench being a familiar tale for Raith throughout pre-season season and into the cup campaign. The manager is asking some of his younger lads to step up to the plate now they’re needed, and reckons they’re doing just that. “We’re still short of a few and asking young boys to do a difficult job at the moment,” said the manager. “They’re playing game after game in a short space of time which some of them haven’t done, but they’ve done well. Wedderburn impressed after the break as he came on a straight replacement for Davidson. 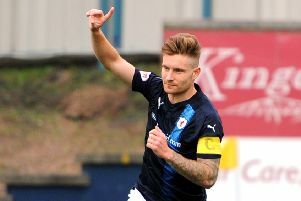 The midfielder is set to play a prominent role for Raith this season, so the manager reckons it’s crucial he gets minutes under his belt and brought up to speed. Raith fans will have a new ground to experience this weekend when they make the trip to Cove. The Highland League side officially opened their Balmoral Stadium, situated in Cove Bay, in July this year.